I've heard a lot of good things about Webs.com that I decided to try it out myself, to really see if you could make your own website for free. Besides, I didn't want to recommend something I haven't tried. Why am I recommending a website that allows someone like you to do it yourself — for FREE — when I also get paid by people like you to design website? That's because (as I have mentioned on another page about free website builders) there are limitations and cons. And those who are my clients are ready to push past those limitations and have their website professionally done. 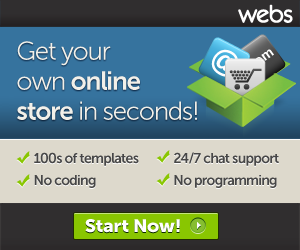 I think one of the greatest advantage to Webs.com is the drag-and-drop builder. It's super, SUPER easy to use especially for anyone that doesn't know how to code. And even if you do know a little HTML, they have a feature for you to add in your own code too. 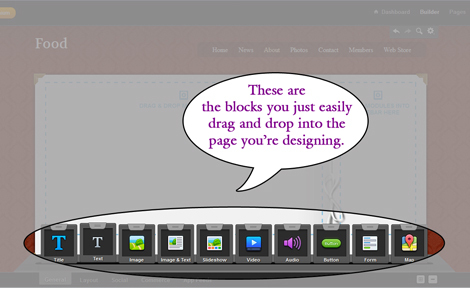 The block elements you can add include things like text, columns, images, slideshows, video, audio, forms, maps... The image below is an shot of what the builder looks like. A screenshot of the free website builder (of course, depending on your template design it will look different... this one is for a restaurant). 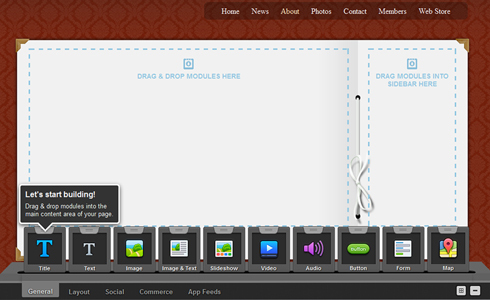 A screenshot of the drag-and-drop elements you use to build your website. The control panel or dashboard is very organized and makes managing your website quite simple. It's really helpful because it gives you a Successful Website Checklist and then shows you the percentage of items you have completed, so that you can stay on track. A screenshot of how your dashboard looks when you login. You can add Google Analytics and Webmaster Tools to track traffic and all sorts of other things. Customer support can be accessed 24 hours a day / 7 days a week. Most, if not all the templates offered on the site are mobile-ready. An Online Store can be added on and connected to PayPal or Google Checkout. Like most free website makers, Webs does have some limitations. Yet, some of the limitations are not permanent. You can always upgrade to another level of hosting to get past issues like low web storage or custom keywords for every page. The free version is limited to 5GB of bandwidth - which means that can limit the amount of visitors you can have on your site at one time. If you are using the Online Store feature, only 10 items can be posted using the free version. 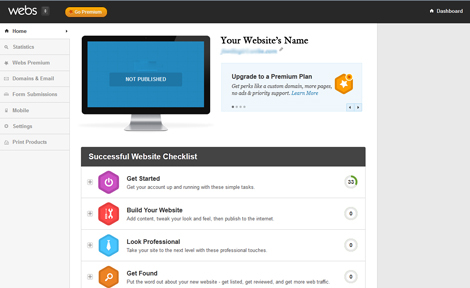 The footer contains Webs' branding, which can only be removed if you upgrade to the paid version. With most web builders, they tend to add unnecessary, bloated code and also have glitches which can make your site function improperly. This is important to watch out for because bloated code in the background of your pages can make your website load slow, causing some to click out of your site if it takes too long. I would rate Webs.com a 9 out of 10. It has a lot of capabilities yet it's not that complex so I feel it's a winner! One of the main cons that concerned me was bloated code. Yet, I gave Webs a good score because although the coding is not so perfect, it's still pretty good for computer generated code (especially when compared to other builders).